"I'm done" has become "I won". Some 3,955 days after his last Major championship victory, Woods scored a win of global importance here at the Augusta National club, where his dominance was broken 14 years ago, and where for a while he was sliding towards honorary starter status. Jack Nicklaus could rest easy. His tally of 18 Major titles was never going to be broken. Woods was a force of nature that had run aground on 14, with the 2008 US Open at Torrey Pines. A place was laid out for him in sport's long history of fallen idols. His slow return to form last year was intriguing enough. But nobody really drew a line from there to the Green Jacket being draped on his shoulders again on the stage that sent him stratospheric with his first Masters rampage 22 years ago. As great comebacks go, this one takes some beating. To avoid overstating it, acknowledgment ought to be given to Muhammad Ali's three years out of the ring before he returned for the Rumble in the Jungle and Thriller in Manilla, for life-risking battles with George Foreman and Joe Frazier. In golf alone there have been seismic wins over misfortune and over time. In 1949, Ben Hogan survived a head-on collision with a Greyhound bus on a misty Texas road, but returned from near death to win six more Majors. Nicklaus, too, returned from the fog of time to win the 1986 Masters, 23 years after his first, at 46. 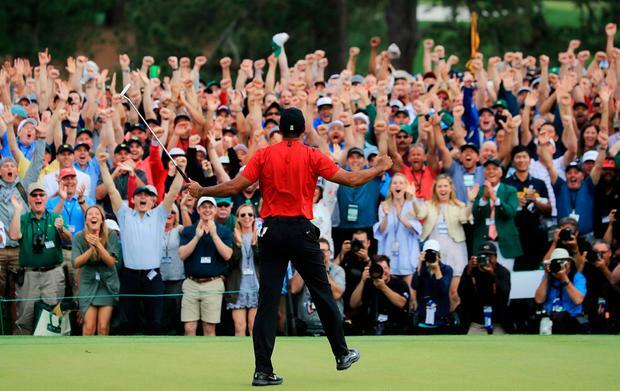 Woods, at 43, now moves above Arnold Palmer with five Masters titles, one behind Nicklaus, with five more years to play with before he reaches the age beyond which no one has been fitted for the green blazer: 48. Let us count the remarkable aspects of a win planted in the middle of America's Sunday schedule rather than the traditional evening slot because of approaching thunderstorms, which had the Augusta National in a tizz, as though a comet were heading their way. The churches round here have been telling us judgment day was coming and so it seemed as the 83rd Masters moved to its early denouement with a packed leaderboard, but still no sign of faltering by Woods. Four sub-par rounds of 70, 68, 67 and 70 pointed to a consistency that had been lacking until the old fire flared back to life with a win at East Lake, Atlanta, last autumn. On his final round here, Woods broke the metronomic Francesco Molinari and held off Dustin Johnson, Brooks Koepka and Jason Day - among the leaders of the new elite since the old champ's body and soul fell weakened. On the back nine, when his back might have rebelled, or the pressure swamped him, there was a serenity about the 2019 champion as a new generation of leading golfers felt his force. The galleries loved him for it. 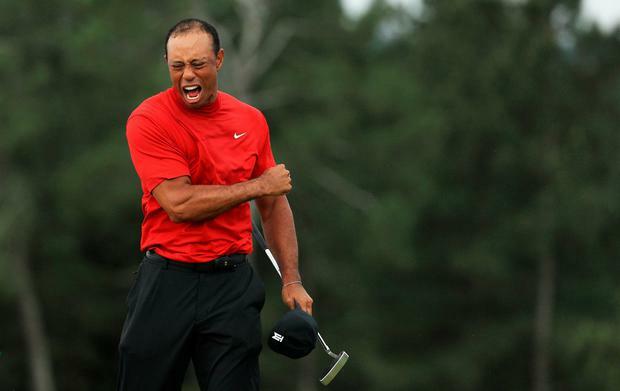 Never has Augusta erupted in such spontaneous emotion. To the memory came those far-off days when he was up there with Michael Jordan or Roger Federer; but also the police mugshot after his driving-under-the-influence conviction in 2017, when beating a painkiller dependence was about as high as he could aim. A picture was drawn back then of an isolated, lonely figure, enfeebled by injury. On the simplest level, here, two years later, was the Bionic Man, rebuilt to withstand the strain of contorting the body to hit a little white ball. Gone were winces and cringeing when Woods threw his body into shots. The old smooth power was back. But there was another more human dimension, instantly recognisable around the world, and rooted in the uncertainties and upsets of family life. To see Woods striding towards the children who were part of his marriage break-up, and who have seen their father shuffle through the wilderness years in physical pain, was affecting on a level even a golf-hater could understand. 1997-2008 pre-dates their cognisance of it, yet here he was showing them why he persevered, why he went through it all. No wonder his voice broke when he recalled those embraces. People around the world will have understood it, too. Not many of us get to make points about family life by seizing the Masters, 14 years after we last won it.